Commodity Trading Advisor programs are experiencing another down year on the average according to official sources. This adds to a long streak of disappointing returns in recent years and despite trends forming in several markets. This article is based on group performance data and it does not apply to any particular CTA that manages futures or uses trend-following. In a statistical sense, individual performance may diverge significantly from averages due to either skill or luck. In the last 12 years, since 01/2006, top 20 CTAs annualized return is less than 2%. This is not very meaningful performance even when argued on the basis that these programs have low correlation with the stock market. (1) Markets have changed significantly. 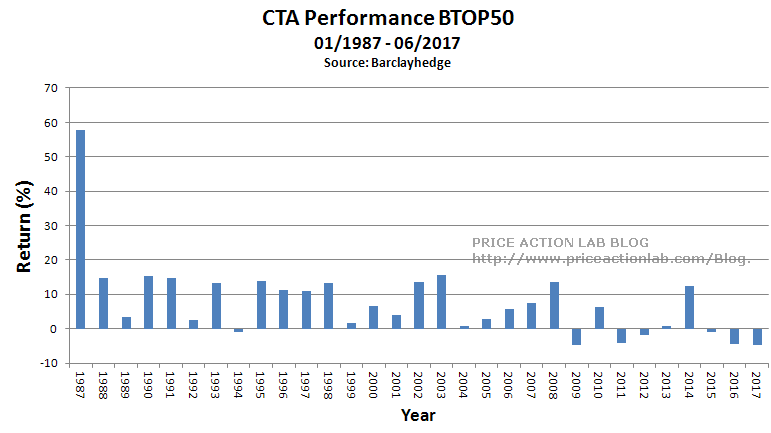 CTAs should not rely on returns from many years ago when pit traders dominated. The world has changed and they must also change. The large returns of the 1980s are not coming back. There are not enough counterparties willing to lose to CTAs at this point. In the past most gains came from random traders using naive technical analysis (chart patterns, simple indicators, etc.) Nowadays most of those recreational traders are already ruined. (2) CTAs should not expect strategies with names borrowed from cute animals to work in the era of algo trading and machine learning; there is an expiration date to all strategies. Success requires continuous innovation. (3) It is hard to generate alpha when trading many futures markets, in some cases more than 30 or 40. Although some think this is an advantage, it is actually not because these strategies are market beta and not alpha. Some CTAs were misguided by naive quants in using multi-market models fitted to historical data that broke down in forward trading. Although most of these naive quants are now out of the business, the CTAs have not updated their strategies. (4) No barrier to entry: anyone with access to capital (a trader with a large marketing department) can buy a naive book written by one of those failed CTAs, copy the code, and sell a CTA program. Obviously, this is not good for the group. (5) CTAs should start becoming familiar with mean-reversion, statistical arbitrage and machine learning for executing short-term long/short strategies instead of relying on longer-term trend-following.